Since the church is the assembly called out by God from the world, it should meet continually for the spiritual living and blessing. As water is to the fish, and air to the birds, so are the meetings to the Christians. When we meet in the name of the Lord (Matthew 18:20, For where there are two or three gathered into My name, there am I in their midst. ), we enjoy His presence in a special way, His presence will bring us grace, peace, life supply and all kinds of blessings (Luke 24:33-36, And they rose up that very hour and returned to Jerusalem, and they found the eleven and those with them assembled together, saying, The Lord really has been raised and has appeared to Simon. And they related the things that occurred on the road, and how He was made known to them in the breaking of the bread. And as they were speaking these things, He Himself stood in their midst and said to them, Peace to you.). Every Sunday, the Lord’s Day, the church gathers for the meeting. The first session from 10:00 am to 11:00 am is the Lord’s table or the Lord’s supper meeting (1 Corinthians 10:21, You cannot drink the Lord’s cup and the demons’ cup; you cannot partake of the Lord’s table and of the demons’ table; 11:20, When therefore you come together in the same place, it is not to eat the Lord’s supper;). The second session from 11:00 to 12:00 noon is an open meeting called prophesying meeting (1 Corinthians 14:23aIf therefore the whole church comes together in one place…; 24…if all prophesy and some unbeliever or unlearned person enters, he is convicted by all, he is examined by all; 31, For you can all prophesy one by one that all may learn and all may be encouraged. ), in which all are free to speak what they received and enjoyed from the Word the previous week for the building up of the church. On the first and third week of the month, we enjoy our meals (love feast) together prepared by members of the church following the meeting. 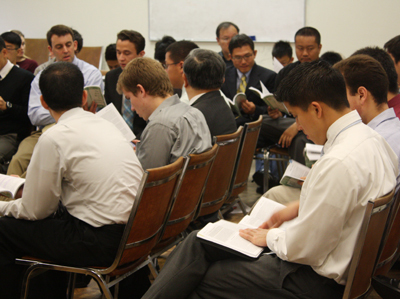 Our meetings are multilingual, currently in English/Spanish and Chinese. We also have children services and young people meetings.